Todd, can you see Russia from here? Bye! Are Canadians allowed to pick on Sarah? LOL. Just remember: You're between Alaska and the Lower 48... You're surrounded! Moooooog: Laughing all the way. John: Of course. I do it about once a week. Ha! Terrific rendition of the old popular Christmas song! I'd do her even if her book sucked. As long as she did too! I'm with moooooog on this one. I'm in Russia. I'm staring back at her. Fun piece, but can we retire any and all mention of this chick with the end of 2009? Can American all be wrong? Hey, moooooog she's wearing a thong! tee hee. love it...happy tt! Quirks: Thanks. I had fun with it. I think she left it in Alaska, thank goodness. Don: I wonder if Tiger Woods beat you to it? Wings: I'm with you. Unfortunately, I don't think it's going to happen. Brian: Thanks, man. Happy TT. Oh, going rogue! I thought it was getting rouge. Dang-didn't think this angle at all! Bravo! Ronda: Yeah, I could have gone in that direction too. Chris: Sometimes the mind works in mysterious ways. who said she's hot?! Ok, compared to Howard Taft, for sure. Tom: Not me. I never said she was hot. Afraid I've got some misguided friends. If her book is written anything like she speaks, I'd rather be stranded in a snowstorm - forever. Ha ha, great new version of an old song! Me likes! Angel May: You know when asked she said she couldn't comment on the Kyoto Accord as she'd only ever seen the Honda. Dot-Com: I'm glad you enjoyed it! 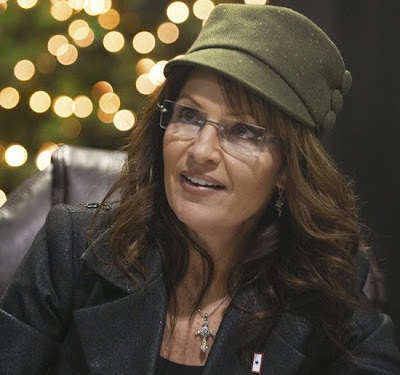 Palin's hot? I think Moooog needs a new fantasy. Speaking of poems, my captcha word is "valinga." That sounds dirty, like most of what Palin and Glenn Beck have to say. Mike" Valinga all the way, hey! The thing I like best about Christmas music is that it's only popular for a month before people get SO SICK of it they can't stand to hear anymore. 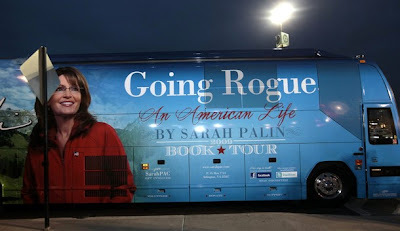 With luck, any mention of Going Rogue will be crammed in the proverbial attic come January. WordWire: With any luck, indeed! But I think, unfortunately, this is just a practice run for 2012 and we'll have to put up with her for some time yet - sigh. Dreamhaven: Thanks a lot. Glad you liked it.